CARTERET, N.J. (CNS) — A three-alarm fire that raged through St. Mary’s Ukrainian Catholic Church late Nov. 27 left the landmark church on Roosevelt Avenue in Carteret a total loss. No one was injured in the blaze that sent tongues of flame into the night sky while smoke billowed out of broken spaces that once were beautiful stained-glass windows and holes in the roof made by the firefighters to gain control of the conflagration. The fire started around 10 p.m. in the right rear corner of the building in a concealed spaced between floors before it spread to the attic and then the church’s roof, Carteret Fire Department Chief Mark Hruska said. Crews from several towns assisted Carteret firefighters in extinguishing the fire. The cause did not appear suspicious but was still being investigated. Inside, huge sections of the floor were completely burned and opened up to expose the basement. Many interior walls of the church once adorned with their decorative painting and stencil work were severely damaged, exposing the wooden studs. The parish, which is in the Ukrainian Catholic Archeparchy of Philadelphia, was founded in 1949 to serve Middlesex and Union counties. The church was built in 1954. 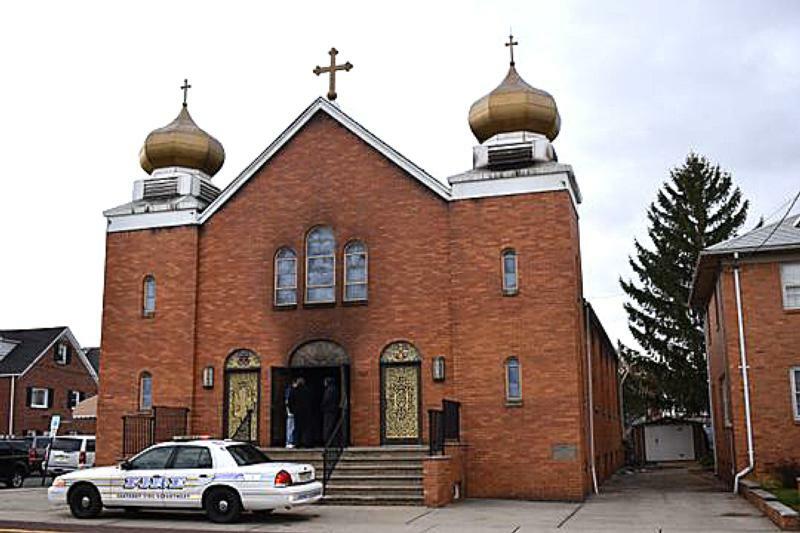 Father Vasyl Vladyka, St. Mary’s pastor, said he and his family were in the parish rectory the evening of Nov. 27 and suddenly smelled smoke, like something was burning. Going up to the second floor of the rectory, they looked out the window and saw flames coming from the right side of the church. The destructive flames were taking the church where Father Vladyka has celebrated countless Divine Liturgies, welcomed new parishioners with the mysteries of initiation, married couples in the mystery of crowning, heard penitents seek forgiveness through the mystery of reconciliation and conducted funerals for the faithful called home to the Lord. Bishop Andriy Rabiy, apostolic administrator of the archeparchy, went to Carteret Nov. 28 to meet with Father Vladyka, offer his support and assess firsthand the damage and to help find a new place of worship until a decision is made as to whether the church can be renovated or a new church will have to be built. “They lost everything — vestments, prayer books, icons, chalices — everything except their faith!” Bishop Rabiy said in a statement. Several churches in the area already have offered their churches as a temporary home where St. Mary’s congregation will be able to continue worshipping as a parish community. During the day after the fire, parishioners and neighbors stopped by to see the edifice of the church now scarred with smoke residue and smashed stained-glass windows. The smell of charred wood hovered over the area. Many reminisced about what the church has meant to them and their families over the years. “It means everything because there’s not too many of us left anymore and so it binds us together,” added Lydia Singura. Carteret Mayor Daniel Reiman was on hand to lend his support, and right away had posted a picture of St. Mary’s on the borough’s website, to tell residents that donations to help support the church will be accepted at the Carteret Business Partnership. Bishop Andriy requested all parishes in the archeparchy take up a special collection for St. Mary’s Fire Fund at all Divine Liturgies the weekend of Dec. 8 and 9. Besides new Jersey, the archeparchy has parishes in eastern Pennsylvania, Delaware, the District of Columbia, Maryland and Virginia. He also asked people remember Father Vladyka, his family and parishioners of St. Mary’s in their prayers.